Last Wednesday I dashed to the Ann Arbor Farmer's Market on my lunch hour. I was on a quest for cherries, so I rushed by a vendor who was calling out to shoppers about his beautiful lettuce. A little while later, after getting lunch at Monahan's, I was feeling more leisurely and this time I stopped. He has a total of fourteen varieties, including green butter head, red oak leaf, green oak leaf, red romaine, green summer crisp, and red summer crisp. About five were available on the day I stopped by. Prices are based on the size of the lettuce head, ranging from around $2.50 to $4, which I appreciated as I could pick the size that best meets my needs. Salomon is new to owning his own business, but he isn't new to farming. His agriculture experience goes back to high school and more recently culminated in 2008 with a Masters of Science from the MSU Department of Horticulture, with his research centered around compost. In between high school and graduate school, he worked on a family dairy farm in Wisconsin, a large diversified farm in Germany that did everything from livestock, dairy, and vegetables and grains, a small farm with just 14 hand-milked dairy cows in Switzerland, and a large farm in Brazil producing dairy, medicinal herbs, and vegetables where he oversaw vegetable production for 2.5 years. All were biodynamic farms. Back in January, Salomon was talking to friend and farmer Jim Koan of the organic Al-Mar Orchard about not having a job since graduating. Jim offered Salomon the use of some hoop houses at Al-Mar Orchard, and Salomon Gardens was born. He is starting with organic leafy greens, but intends to branch out to a full range of vegetables and herbs from beans to zucchini. He currently sells at the Ann Arbor Farmers' Market on Wednesday, and on Sunday's at the East Lansing Farmers' Market. In the Fall, he will transition to the Saturday markets in Ann Arbor where he hopes to offer winter crops of Swiss chard, spinach, lettuce mix, kale, collards, and squash, but at present he is enjoying the more moderate pace of Wednesdays and the opportunity to get to know his customers. Of running his own business, Salomon says, "It is very different doing everything than joining an existing farm organization. I have at least five fires, each with two or three irons to tend to. With the supportive farming wisdom of Jim and Albert (Jim's father) Koan I am to keep on task - just enough - without getting too overwhelmed. "Market day is just great! I get to meet and talk with the people who are having a great time with friends, family, and enjoying the overall experience. It offers me an opportunity to balance the rest of the week of direct farming. Rather more extroverted, a bit less physical, but just as fun!" In March we went to England to visit friends and family. And eat a lot of good food, because Britain is actually full of really good food. We arrived on a Friday morning and sacked out most of the day, while our friends who were hosting us went off to work. Saturday we hooked up with another friend, P, who took us to Borough Market, which is London's oldest food market. The Market's management claims that its roots go back to Roman times, which is plausible since this is London, though there's only documentation back to 1276. The market was packed. We pushed our way through the crowds and came out into the covered area of the market with more fruit and flower stands, butchers, and baked goods. We're told locals try to shop on Thursdays and Fridays to avoid the heavy tourist crowds. Eventually we came out to a corner of the market and found ourselves at Brindisa. Our friend Gauri told us that we absolutely had to have one of the Chorizo sandwiches that Brindisa grills up on weekends. We were hungry, but we passed up a lot of fabulous food because we trusted Gauri that it would be worth it. You order a single or double portion of chorizo, and Brindisa's cooking staff split a roll and add chorizo hot off the grill with some roasted peppers and arugula (aka "rocket" as its known in the UK). And then you eat. Oh yeah. The wait was worth it. It was pretty much perfect. The sweet pepper was a great foil to the salty and spiced chorizo, and even the rocket added something. The proportions are better if you don't get the double chorizo, but extra chorizo has its own benefits. You don't have to go Brindisa to enjoy at least a very similar sandwich. Pick up some Spanish chorizo (not Mexican style), available in the cold case at Sparrow Market, some arugula, and preserved roasted red peppers with the skins peeled off (I think Brindisa used Spanish preserved pequillo peppers, which are roasted and then preserved). I don't know what kind of bread they used specifically, but a French baguette, ciabatta, or similar bread ought to do the trick. **For example, Jamón ibérico de bellota was only approved for import recently, and has a new 100% import tax for "jamon on the bone" courtesy of an ongoing trade war with the EU because its ban on U.S. beef produced with growth hormones. A quick photo tour of Borough Market in the extended post. Ann Arbor Farmer's Market has always been the place to find (reasonably) locally grown produce and tasty bake goods, but as I passed through the market today I noticed an increasing number of vendors advertising their "local-ness". Along with local baked goods, early season produce, eggs (I saw a lot of egg vendors today! ), are a growing number of CSAs (Community Supported Agriculture). Many are full up by now, but some still have spots available such as "Down on the Farm", which we are considering. It's "Down on the Farm's" first year as a CSA, and you won't find them on a website because they are an Amish farm. (And I hope they don't mind that I'm writing about them here on the Internets.) They use 100% animal and human labor. Fields are plowed and worked with horses. Down on the Farm calls themselves a "customized CSA" because you can mark those items that you particularly love, and even opt to not receive items that you don't want at all. Members will also have the opportunity to buy beef, chicken, eggs, as well as order extra vegetables for freezing or canning. Down on the Farm can be reached by phone and mail, or you can find their stand at the market. The flowers and vegetable seedlings are starting to make their appearance, but Spring Gardening Fever hasn't quite taken over the market yet, making it easy to spot all the delicious food offerings. A complete listing of all the vendors I love buying from would be... long, to say the least, so here are just a few highlight of our visit today. In the bread department, Joe particularly likes Mill Pond Bakery's dense sprouted grain bread that has a tang like a sour dough, and I'm rather fond the lovely whole wheat/oat-blend-molasses-flavored Pendel Hill Brown bread from Community Farm Kitchen (a part of the Community Farm CSA). Served up with plenty of butter, of course! Coffee lovers should check out RoosRoast. John Roos sold me my car — complete with a complementary bag of his coffee, and then shortly afterward he quit the rat race and devoted himself 100% to his coffee roasting business. (And he's looking fabulously happy doing it, too!) We don't drink coffee, but we like to keep some in the freezer for friends who do and today we added a bag of his "lobster butter love" coffee to replace the aging bag of (unnamed corporate fancy brand here). And after seeing and talking about so much great food, we were hungry and ordered up some of Pilar's delicious Salvadorian-style tamales from her traveling tamale cart. Pilar selling her very popular and delicious tamales, and of course... flowers! "Turtle" Bunny or Egg (larger than a normal chocolate) filled with salty caramel and toasted pecans and coated in dark chocolate. Chai Spice - Milk chocolate with a blend of cinnamon, cardamom, and ginger wrapped in a dark chocolate shell. Lemon-Rosemary - White chocolate and citrus-y lemon with a hint of rosemary. Hazlenut Praline - dark chocolate shell surrounding a combination of toasted hazelnuts, caramelized sugar, and milk chocolate. 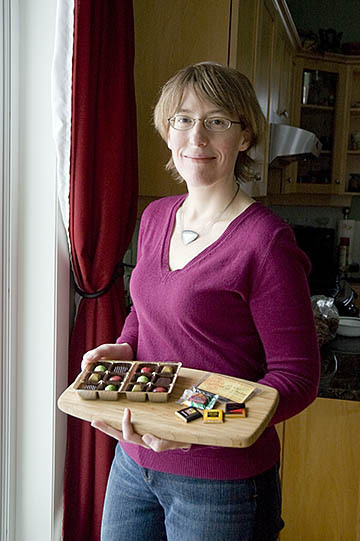 Tammy's Easter truffle collections will be available locally starting Tuesday, March 18 at Everyday Wine, Main Dish Kitchen, and Knight's Market. She also ships across the US and (inquire first) to Canada. Kitchen Chick: Tell me a bit how you became a food enthusiast. You know, some people were interested in being a chef since they were little, while others have some transformative event in their lives. What's your story? Tammy: I don't know that I have a transformative event. I've been interested in cooking and baking for as long as I can remember, and I've forged most of my best friendships around the dinner table. But when I look back at my life, I realize that I've always had an affinity for food-related businesses. When I was a kid, it was sidewalk bake sales. Later, my boyfriend and I made bread and sold it to friends and coworkers - we didn't have a car, and I remember us carrying home 20lb bags of flour on the back of his bicycle! I made apple pies and chocolate cake and sold them to a local restaurant/cafe - I realize now that my markup was ridiculously small and I was barely covering the cost of my materials, but that's what they could afford to pay and I was just so thrilled to have an opportunity to share what I had made. So I guess it's no surprise that my life path has led me back to starting a company where I can share my own creations, and also share my great passion and enthusiasm for all things "foodie." Dark chocolate with cherry notes. Very smooth. Nice and easy on the tongue. Definitely an approachable dark chocolate for someone who is looking to push past the 60% cacao level. The Mora Mora bar took a silver medal at the World Chocolate Awards in 2006. A serious dark chocolate for serious dark chocolate lovers. I thought it had an earthy, almost slightly smoky, flavor, whereas Joe detected a faint burnt caramel edge to it. I really really liked this one and will be looking to buy it again. Deep dark chocolate flavor with cacao nibs embedded in the bar. It tastes darker than its 60% would suggest, probably primarily due to the unsweetened crunchy nibs. I think the nibs also give it a bit of a chalky texture. (But then, nibs are a bit chalky.) I generally like Michel Cluizel chocolate bars, and I love nibs, so this is a nice addition to their collection. My friends know that I really, really dislike milk chocolate. Semi-sweet chocolate chips are fine in cookies. But plain milk chocolate for eating? Not for me. But Joe said that I had to try this one. I had some doubts -- one, it's milk chocolate and two, I'm not a big fan of Vosges -- but then he said the magic words, "it has sea salt" and I was intrigued. Would the sea salt would balance the too-sweet chocolate? Yes. Yes, it does. 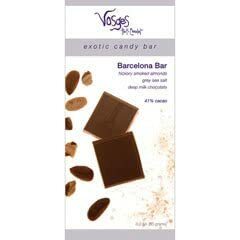 The Barcelona Bar is a fabulous mix of salt and chocolate and almond, with the salt contrasting nicely against the chocolate. I liked the salt so much that I started sprinkling more sea salt on pieces of Barcelona bar. This is a bar I'd definitely buy again, and that's saying something given that it's a mere 41%. Mmmmmm.... bacon! This bar features applewood smoked bacon, alderwood smoked salt, and more of that "deep milk chocolate" (41%). It's really good; you wouldn't normally think of combining bacon and chocolate (well, normal people wouldn't) but it works surprisingly well. The bacon is rich and salty, and also brings a nice umami touch of its own. If we'd had this bar on its own, or alongside more conventional chocolate bars, I think we'd be raving about it. But we had it alongside the Barcelona bar, and it paled by comparison because they're doing some of the same kinds of things and the Barcelona bar is doing them better. Don't let that stop you, though, because it's worth trying in its own right. Just don't do it as part of a tasting flight with the Barcelona or something. All these chocolates are available locally at Zingerman's. I'm not obsessed or anything (Honest! I can quit any time!) but whenever I travel to places where honey is made and sold, I can't resist stopping for some local honey. I went to the North Market in Columbus and came home with a jar of honey. I went to Tennessee to visit relatives some years back, and came home with a jar of sourwood honey (and an embarrassing addiction to roadside boiled peanuts, but that's another story). However, Southeast Michiganders don't have to go far to find small production, raw honey. Michigan is the 9th-ranked honey producing state in the US (there are even beekeepers in the U.P., but they have to use reinforced electric fences to keep the bears out — apparently, the stereotypes about bears and honey are true). 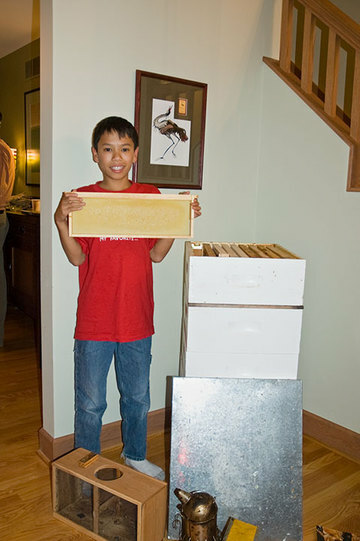 John and Joanne's son Jordan explaining how bees build honeycomb on the frames. Each frame already has a honeycomb pattern on it; the bees then extend the comb out from there. If they didn't have the patterns, they'd still build the characteristic hexagonal-grid combs, they'd just build them wherever they felt like it. This is a family activity and the kids know their stuff. The house was packed with friends and customers. Beekeeping paraphernalia was displayed around the living room. We were drawn immediately to the large dining room table covered with jars of Dancing Crane Honey. Among other things, they had a taste test pitting honey from Dancing Crane (as well as two other SE Michigan-made raw honeys) against a jar of generic Grade A grocery store honey. It's a very effective demonstration. I went through the samples from left to right as advised by the instructions and without looking at the brand names. Let me say: the taste difference between raw honey and generic pasteurized grocery store honey is immediately obvious. Each of the local raw honeys was full of different floral flavors, beautiful on the tongue, and a pleasure to eat plain or on a cracker. (We did like Dancing Crane's best, but we liked all of them.) By comparison, the grocery store honey I grew up with is insipid and boring. I'm convinced, and I think you will be too if you try it. 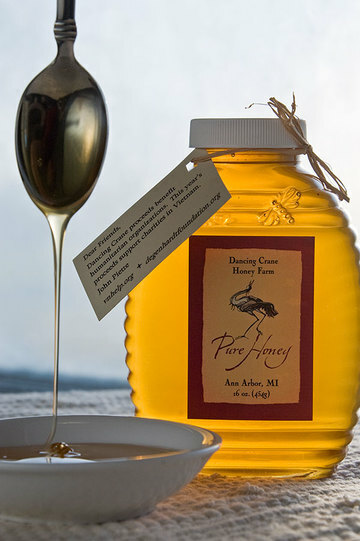 Dancing Crane Honey is an all-volunteer farm (they welcome volunteers to help them at the hives as well as during the annual honey harvest), and all revenue beyond operating expenses goes to selected charities. Their honey sells for $7.50 for a one-pound jar, or $20 for three. This year's charities are VNHelp and The Degenhardt Foundation. Past charities include Doctors Without Borders, and Heifer International. They still have honey left this year, but it's going fast. My recommendation: try some. You'll never go back to the generic stuff.